Dark spot s and uneven skin tone come from a number of sources, such as repeated sun exposure and age, and are one of the most difficult problems to treat. Every day, the skin on hands is often exposed to as much sun as the face, yet usually goes untreated and remains unprotected. Skin Renew introduces Dark Spot Hand Treatment, a fast absorbing lightweight brightening lotion specifically designed to treat dark spots, age spots & discoloration on hands. This nourishing moisture formula with Vitamin C helps fade dark spots, while Broad Spectrum SPF 30 sunscreen, when used with other sun protec t ion mea sures (see Directions), helps protect against future skin damage caused by the sun. Every day, hands are exposed to as much sun as the face, yet usually remain unprotected, causing fine lines, discoloration, and dark spots to appear. 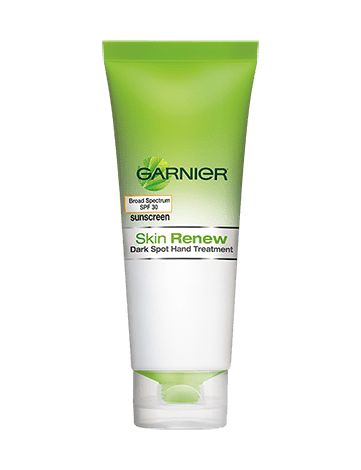 Specifically formulated to treat and moisturize hands, Garnier Skin Renew Dark Spot Hand Treatment with Broad Spectrum SPF 30 sunscreen and Vitamin C helps reduce the appearance of pigmentation clusters and push new, healthy cells to the surface. When used with other sun protection measures (see directions), this lightweight cream helps protect hands against early skin aging caused by the sun. Immediately: Hands are smoother, more even toned, and moisturized for 24 hours. In 4 weeks: Significant decrease in the size and intensity of discoloration and dark spots*, and hands look healthier and younger. Apply Garnier Skin Renew Dark Spot Hand Treatment twice daily, in the morning and afternoon, and as needed. Can also be used on the chest. For results on dark spots on face, use together with Garnier Skin Renew Dark Spot Corrector and Garnier Skin Renew Dark Spot Overnight Peel. Active: Avobenzone 3%, Octisalate 5%, Octocrylene 7%. Inactive: Water, Isononyl Isononanoate, Glycerin, Dimethicone, Diisopropyl Sebacate, Aluminum Starch Octenylsuccinate, Sucrose Tristearate, Polysorbate 61, Alcohol, Ascorbyl Glucoside, Benzyl Alcohol, Benzyl Salicylate, Butylparaben, Capryloyl Salicylic Acid, Caprylyl Glycol, Carbomer, Citral, Citrus Limon (Lemon) Fruit Extract, Dimethiconol, Disodium EDTA, Gentiana Lutea Root Extract, Geraniol, Limonene, Linalool, Methylparaben, Peg-12 Dimethicone, Phenoxyethanol, Sodium Citrate, Sodium Stearoyl Glutamate, Triethanolamine, Xanthan Gum, Fragrance. Rated 5 out of 5 by DiB515 from I miss this product I wish this was still around. It was great hand cream at a good price point. It definitely had brightening effects and and having an spf 30 was key. Working in dermatology, i haven’t found anything similar. If people expect any product to erradicate brown spots completely, that’s just not realistic. But it definitely made a visible difference and offered protection from further damage. I’d love to see it come back. Maybe better marketing was needed. I don’t remember seeing much about it, I just happened upon it on my own. Rated 2 out of 5 by Aygul from no effect I have used it regularly since I got it and it has absolutely no effect. Rated 5 out of 5 by Eli03 from Love it I apply the cream throughout the day. I've noticed my hands are now smoother. The biggest change was how smooth and nice my cuticles have become. I definitely recommend this product to everyone!! Rated 4 out of 5 by PMcC from Great hand treatment! I have very dry sensitive skin, and I wasn't sure this would work for me, but when I found it on sale I thought it was worth a try. I love it! It doesn't feel like much when you first apply it, but it soaks in and over time gets the job done. It has a fresh scent, and I use it throughout the day on my hands and forearms, and it evens out the skin tone and softens my cuticles. Sometimes I even use it in conjunction with my heavier hand cream in extra dry weather. Rated 5 out of 5 by Lola16 from love it! I got this as a sample from work and I've been using it every night for a week on my hands and chest like the box say's I can and i love it! I can definitely tell the difference, my chest looks brighter and flawless! My hands look awesome as well. The smell is beautiful and not overpowering. I plan on buying the one for my face next, but this is something i definitely recommend! Rated 1 out of 5 by NCKP from Deceptive This is simply sunscreen. It is not a "treatment" to correct dark spots as is advertised on the box. I got it home, opened it, and discovered it is glorified sunscreen. Very disappointed. Rated 5 out of 5 by JodyLovesGarnier from Fantastic Hand Treatment! I love that this new hand cream has an SPF 30 in it! It has a very slight, pleasant scent that is not strong at all. It seems like my age spots are lightening up and I am looking forward to the next few weeks results. I was using Clinique's Even Better hand cream but it's three times the price and does not seem to work as well as GARNIER:) I am very happy with the results and will buy this again for sure!